Treat her to sophisticated style. This ladies' Citizen Eco-Drive™ Signature Octavia Series watch features a round mother-of-pearl dial with luminous rose-tone hands and markers, and a date display at the three o'clock hour in a rose and silver-tone stainless steel case. A total of 57 diamonds accent the bezel and hour markers. The reliable Japanese quartz movement ensures accurate time keeping. 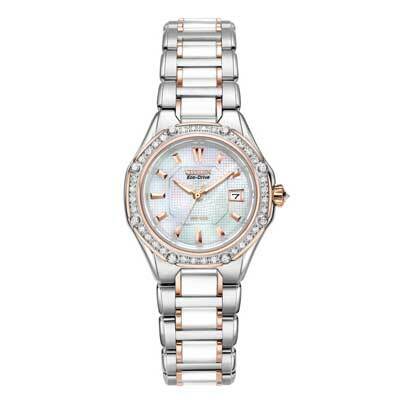 Citizen Eco-Drive™ technology harnesses the power of any light source so it never needs a battery. This watch is water-resistant and the polished two-tone stainless steel ceramic inlay link bracelet secures with a fold-over clasp. It comes with a five-year limited warranty. We are an authorized Citizen dealer.